Gabriel van der Brink’s ‘The Low Countries and the Greater Good’ takes a religious perspective as a starting point to discovering what people in the low countries have been defining as ‘the Greater Good’. Of course, we all (sort of) know the more or less traditional values that religion proclaimes but soon van der Brink e.a. also state that, for a couple of different reasons, believes and values about the Greater Good are proliferated in the Netherlands like nowhere else, depending of course on how you measure certain indicators, and for that you need to read the book. They indicated that these believes and values through time were defined and redefined and emerged in a certain distinctive order. They found nine socalled ‘Objects of Devotion’. So one could say that whatever one was doing during working hours, a certain amount besides that was mainly directed towards the specific object of devotion. So for not native Dutch speakers, the translation is as follows; Lokaal (local), nationaal (national), globaal (global), sacraal (sacred), sociaal (social), vitaal (vital) and God (god), vaderland (home country), werk (work), naaste (fellow, neighbor) samenleving (society), mensheid (mankind, humanity), liefde (love), lichaam (body) and natuur (nature, enviroment). Recently designers at KRAMM/WEISHAAR published their findings of their Code_N Project on a 32.000 square foot infographic at this year’s CeBIT computer expo. 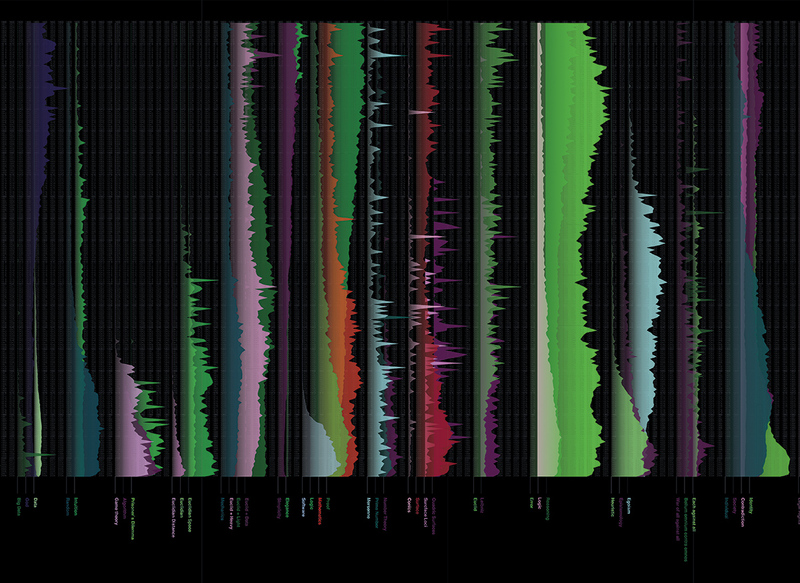 They recorded more than 400 terms from Google’s 400-billion-book database and clustered them into topics, some of which seem to correspond to the ‘Objects of Devotion’ of van der Brink e.a. mentioned above so the graphs here show the relative usage of the terms between 1800 and 2008 (note that van der Brink e.a. write about the 1700-2000 timeframe). So what do we see? Terms like ‘Data’ and ‘Big Data’ slowly increase as the relative usage of ‘God’ decreases. The project shows that interesting cross references can be scientifically researched all over again, but also made visual in order to explain and show. So why not look for more 'objects of devotion' like creation, innovation or progress as an life goal. Companies and organizations also do recognize the importance of some of these higher goals for some time, think about the environmental (slow) shift in thinking that took place the last decennia, although knowing for 'the lonterm better' and not only for the ’shortterm good' isn’t exactly firmly grounded in organizations policies.